READING, Pa. – In another step towards breaking ground and the eventual completion of the National Velodrome at Albright College, off-the-track floor plans and leasing opportunities were released by the velodrome developers early Monday morning. In addition to the world-class 200-meter velodrome, a Cycling Performance Center, gift shop and the Bell Lap pub and restaurant at track side, a limited number of appropriate commercial tenants will be able to lease space within the building, perfect for health and cycling related businesses. 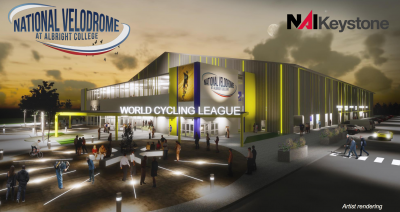 To lead the charge with the leasing opportunities, the World Cycling League and National Velodrome at Albright College development team brought in John Buccinno of NAIKeystone. All told, there will be 8,000 square feet available for other businesses and organizations to couple their initiatives with a world-class velodrome and other amenities, all under one roof. Click here to view more details on leasing opportunities, floor plans, and all that the National Velodrome at Albright College will offer.